Where do you hear God best? As you sit reading His Word over your morning coffee? In church listening to the Sunday sermon? For me, it’s so often in the lessons He reveals in nature, when I’m unencumbered by the busyness of the day. Early one vacation morning, as I sat on my towel on the damp beach sand, stilling my own heart, another family was getting set up for the day just a few feet away. The parents spread out their sheet and anchored their beach umbrella in the wet sand. 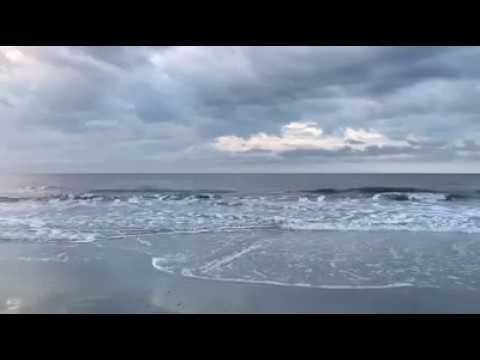 As they did, with their backs turned toward the water, I looked on as their little girl, who could be no more than four or five years old, ran into the surf, splashing all the way. Wave after wave crashed upon the shore with certain authority, taking with it sand, seaweed, shells, and the very footprints that had walked there moments before. Soon the mother looked up, surveyed their belongings, only to find her little girl absent. She caught my eye in a moment of panic, and I quickly but calmly pointed to the rolling waves, where I had been watching all along, ready to run in a second if the need arose. “What?” The daughter calmly asked in response. “WHAT?! ?” she yelled, in return. But the little girl couldn’t hear a word her mother screamed over the roar and whir of the waves. Her mother was desperately trying to keep her safe. But all the shouting and screaming was doing that little girl no good, if she could not or would not hear her. 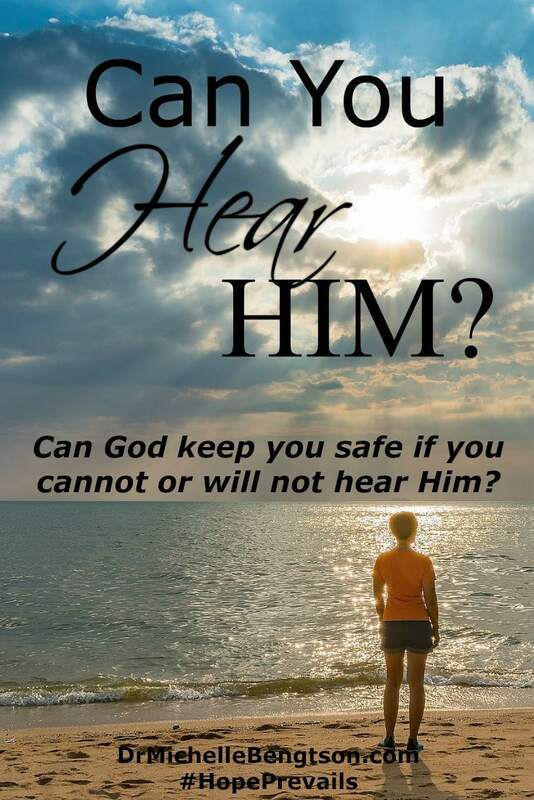 Can you hear #God when He calls? Does the noise of the world drown out the Voice of safety? I have to wonder: How often am I that little girl? How often do I leave the safety of my Father’s shelter? How often do I go my own way, out of His will for my life? How often do I get so ensconced in my sin that I no longer hear Him when He calls or attempts to warn me of the danger? Oh Lord, keep my eyes focused on you, on your way, on your will. Let me always listen for your voice. Let it be you alone that I hear. Never let me let go of your right hand or move so far away that I can no longer hear your voice. For you alone I seek and serve. I think I hear best when we sing in church. Outside of that I really struggle to discern. I pray and feel the sting of quiet echos as I listen. Same when I read scripture. But something about singing in church brings about a closeness that I don’t “feel” in other ways. I still don’t feel like I hear him per say but at least I feel him! Thanks for sharing. Visiting from Lori’s Moments of Hope! I definitely hear Him best when my mind is relaxed. Often when I walk or run in the mornings I hear His voice. I also hear Him when I listen to instrumental praise music. I can focus better on writing or studying with a bit of soft music in the background. I love listening out for His voice each day! “For me, it’s so often in the lessons He reveals in nature, when I’m unencumbered by the busyness of the day.” Yes! Me, too! I love spending my Saturday afternoons at the lake, or maybe in a national park, where I can just sit, drink in the beauty of the world God made, and listen for His voice. I have to admit it is all too easy to let the voice of the world drown out what He is telling me. Love your analogy of the little girl at the beach! Often I hear in the shower! 🙂 Sometimes right before I wake up a Scripture comes to mind to guide me. And in my quiet time with the Lord. My favorite time to listen for God is early in the morning when the house is quiet. There is just me speaking to God, lifting up prayers of gratitude! Such an important truth. The voices in our world are so loud! It’s crucial to quiet ourselves to hear the voice of our Father. 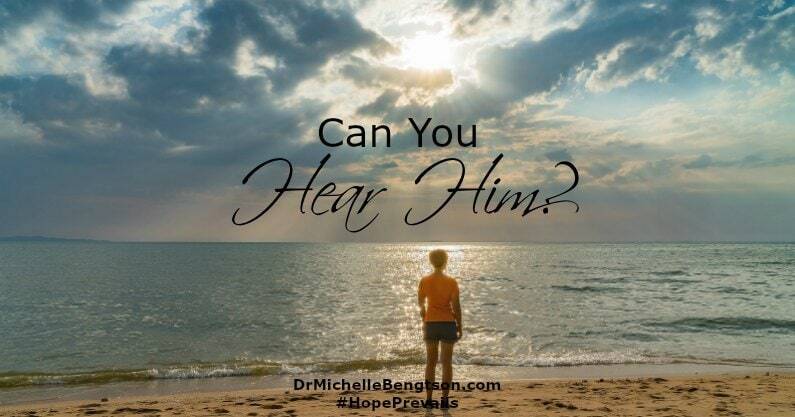 I hear Him when I am listening to the teaching of His Word. Thank you for a good reminder to keep ourselves from straying too far that we may not even want to hear His voice. So thankful we have a Good Shepherd who always searches us out when we stray too far.